What's Going On Inside the Brain When We Play Music? Humans love music, especially when there's repetition that catches the attention. And even though many people listen to music to relax, the brain is doing a lot of work to break apart and understand the music before putting it all together again. Brain scans of people listening to music show many different parts of the brain firing at once, but that's nothing compared to what's going on inside the brains of musicians themselves. 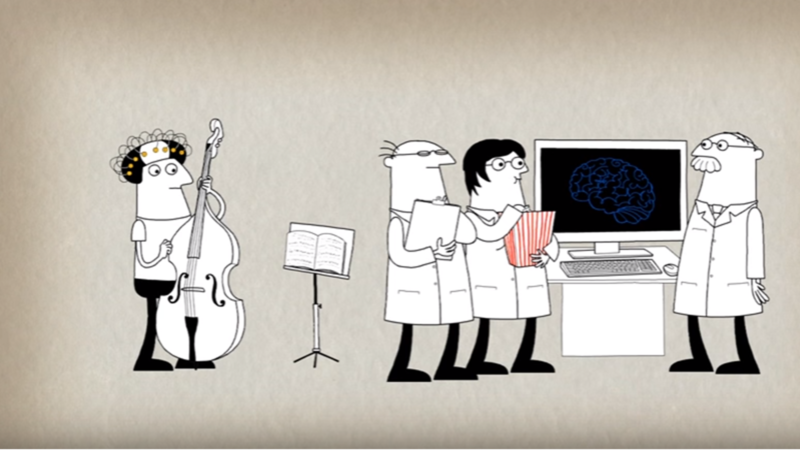 "Playing music is the brain's equivalent of a full body workout," says educator Anita Collins in a TED-Ed video on how playing music benefits the brain. Playing music requires the visual, auditory, and motor cortices all at once and since fine motor skills require both hemispheres of the brain, the act of playing music may strengthen the bridge between the two sides. In studies comparing playing music to other activities, including other forms of art, playing an instrument is uniquely powerful for the brain. Watch the video to learn all about the benefits of learning to play an instrument.